We should campaign to get the sheep back in Central Park! Kicking them out is animal cruelty! OMG! THE SHEEP DON'T CARE!!!!! Wow, it reminds me of cotton candy! Interesting, now when I'm driving, someone in the car'll yell "OMG LOOK IT'S RAINBOW SHEEP!" and i LOVED the LOL cats! Cute sheep! Some one should take the wool and make multi-coloured yarn! theatre , i love your coment it's true causes like school shootings, global warming, and murder should be more important than dyeing a sheeps wool pink when it doesn't bother, stress or hurt them. I sort of agree. But pink sheep? 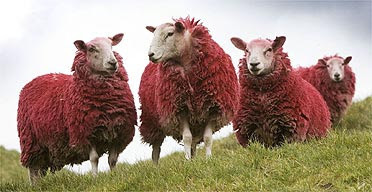 I would love to dye my sheep (ifI had any) bright yellow with black smiley faces. Today's Installment of WHAT IS IT?